Hi, my name is Tatyana. I chatted with a HopeCoach recently about how my parents separated before I was born and how I’ve had problems with my step-mom. She verbally abuses me and says things about my birth mom and lies to me about stuff. My HopeCoach helped me a lot, gave me a lot of advice and internet sources. We prayed and I feel a lot better because I talked to her. If your parents are divorced you may have some difficult relationships in your life, like Tatyana had with her step-mom. 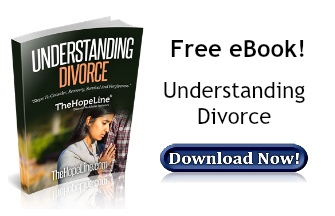 You can download your free eBook for more information on dealing with divorce.